Inspired by the stage and the needs of professionals, MAKE UP FOR EVER’s collection of expert lipsticks dress your lips in vivid pigments and show-stopping finishes. 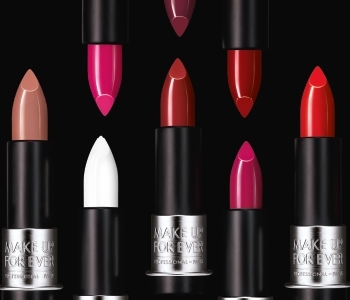 Catering to your every lipstick needs, there’s a shade, formula and finish for everyone within MAKE UP FOR EVER’s vast range of subtle and statement lip colours. Long-lasting and comfortable to wear, get creative with colour and choose between matte, sheer and satin finishes.